Some of these may surprise you! Have you ever left your cellphone in a taxi? Maybe your wallet in an Uber? How about a puppy, fog machine ... or breast milk? 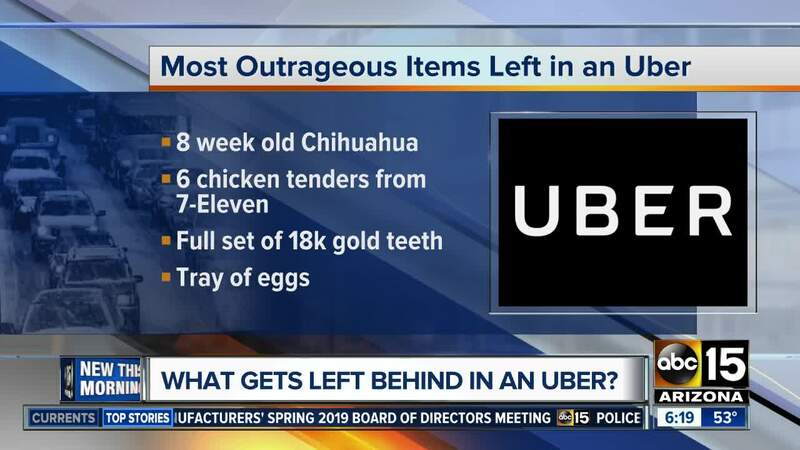 Uber has released its third annual Lost and Found Index — and there are some pretty strange items on the list. If you have been forgetful, chances are you've lost one of the more commonly forgotten items, which Uber says include phones, cameras, wallets, keys, bags, clothes, glasses, headphones, vape/e-cigarettes, IDs and licenses. On the list of most forgetful cities is Gallup, New Mexico; Tallahassee, Florida; Mankato, Minnesota; College Station, Texas; Sioux City, Iowa, and other areas in southern states. If you happen to have lost something on one of your Uber rides (as weird as the item may be), you can log in to your account, find "Your Trips," tap "I lost an item," and then contact the driver with your chosen means of communication.